Le Labo is one of those brands that I’ve only really had a passing interest in. On the one hand they appear to create, for the most part, good quality scents with more than your usual level of artistry (let’s face it, there are so many niche houses that don’t), whilst on the other they’ve always seemed a tad gimmicky for my tastes. Maybe I’m just being a grump, but there’s something about their industrial aesthetic, the odd naming system (the name of the most prominent ingredient followed by the number of ingredients) and the ‘blended on the spot’ approach that narks me, almost as if they are trying just a little bit too hard to be ‘hip’. Still, none of that should get in the way of the fact that the majority of their output is solid, wearable and interesting. This summer the brand has launched two florals – Lys 41 and Ylang 49 – a duo that they are calling “the imperfect twins”. Working with perfumers Frank Voekly (Ylang 49) and Daphné Bugey over the last three years, Le Labo have created “two new floral statements” that are likely to surprise, ensnare and entertain many a perfume-lover. Those who are ‘in the know’ with all things Le Labo will be aware that just because it says ‘Lys’ on the bottle doesn’t mean that what’s contained within will be a big lily soliflore, in fact it usually means the exact opposite and Lys 41’s no exception. Upon the first spritz one notices that the flower that reigns supreme here is in fact tuberose (she has a habit of doing that) and in Lys 41 the flower is incredibly sweet and rubbery with soft hints of green menthol. There is a good dose of lily lurking somewhere in Lys 41, it’s just not that easy to find. At times a fleshy, saltiness can be detected amongst the onslaught of tuberose, but it’s not entirely obvious and it works nicely to soften the sweetness of the more domineering flower. The jasmine however, appears to be absent without leave – if anyone sees it, do let me know. 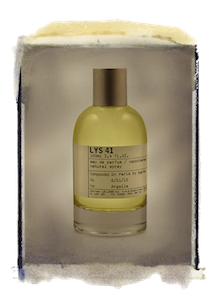 What starts out as the rubbery-sweetness of white flowers intensifies to full-blown vanilla cream as Lys 41 dries down. It’s not a massive-gourmand fest though, thanks so to a sufficiently strong layer of velvety musks that drive the florals to an almost narcotic level of intensity. Lys 41 is very nicely done but it’s nothing we haven’t smelled before. Of course that is not a bad thing at all, there’s always room for well-made, beautiful scents that don’t push the envelope – not everything needs to be unique and I would happily recommend it to any white floral lovers who are looking for a salty, tuberose bouquet with a distinct happy-go-lucky character. Ylang 49, like Lys 41 does not do what it says on the tin. With ylang ylang being a flower synonymous with banana-esque tropical compositions, one would expect a great big exotic bouquet of flowers from a fragrance named Ylang 49, but no – that’s just not the way Le Labo does things! Many will be pleased to know that Ylang 49 is in fact a soft and luxurious chypre – a rare bird amongst modern perfume launches. The top notes display an interesting mix of notes, with sour, dusty rose (thorns and all), patchouli and moss right from the outset. Like most proper chypres the effect is a little unsetting at first with things being well balanced but also sharp and cruel. In time, a good old-fashioned chypre plush-ness pushes forward creating a comforting and rather delicate accord of powder, moss and resins. The ylang itself gives a mere hint of tropical plumes and that’s probably a good thing, anything more than that would upset the balance of what is a tremendously well made perfume. Proper chypres are hard to find, but like buses one seems to wait ages for a decent one to arrive and then two turn up at once. Ylang 49, along with Etat Libre d’Orange’s phenomenal The Afternoon of a Faun (both of which have been released in the last 12 months) serve as vastly different and contemporary takes on the most classic of genres – thanks be to the perfume gods that there are creative noses out there bringing the new and the old in sync perfectly. Both Lys 41 and Ylang 49 are available in 15ml, 50ml, 100ml and 500ml Eau de Parfum with prices ranging from £40-£410. Notes and quotes via Le Labo. Image 1 via Le Labo. Image 2 via boisdejasmin.com. Posted in Chypre, Floral, Le Labo, Perfume Reviews, Unisex and tagged Chypre, Daphné Bugey, Floral, Frank Voekl, Le Labo, Lys 41, Ylang 49. Bookmark the permalink. I know these aren’t quite what you expected, but I still can’t wait to try them, as they contain – on paper at least – some of my favourite notes. In fact just this week I was pipped at the post on eBay trying to buy a sample of each! Oof, being pipped at the post on eBay is so annoying. I think these two will find many fans! Le Labo also narks me – I’d add city exclusives to your list of reasons. However, these two did sound interesting, so I was pleased to read your reviews. I’m not sure they’d work for me. I’m not a tuberose person and though I like chypres, I’m not a fan of the cruel and sharp variety. I think I might be better off with The Afternoon of the Faun. Have lots of fun in the sun this weekend! Ah yeah, I’d forgotten about the city exclusives. I hate exclusives! The Afternoon of a Faun is to die for! Have you sniffed it yet? Haven’t tried it yet but will do! I reckon I might like these by the sound of it. Like you I am a tuberose freak, and chypres are always welcome as well. Would you actually wear the Lys? Is it up to the top notch tuberose scratch? Hmmm, good question! I don’t think I would wear the Lys, simply because I have about 5 or 6 tuberoses I’d pick over it. Absolutely! God love that Amouage! I haven’t tried Lys yet but Ylang really works for me, not suprising since chypres are my thing since my first bottle of Mitsouko. Afternoon of a Faun is also very impressive, but a bit too much immortelle for me. Ylang I probably need a FB of, at least a 15 ml one! I just tried these one my skin yesterday; Ylang 49 on one arm and Lys 41 on the other (on a sidenote, these numbers are a bit much for me. I can barely retain the names let along accompanying digits!). I was expecting Ylang 49 to be the one I would prefer, but lo and behold, I liked Lys so much more! It was exactly as you said: rubbery white flowers and full-blown vanilla cream. If you had handed it to me blind, I would have trouble identifying it as a lily. Totally – the lily is subtle with a capital ‘s’. There’s something quite sunny and happy about it I find! Lys 41 is too feminine for my taste, but, Ylang 49 blew my freekin mind, it’s the only thing I’ve worn this summer. A classic Chypre with a floral overdrive heart…..Afternoon of a fawn is also in my collection, I like it. but, my favorite Chypre is Chypre Palatin by MDCI, wow! I can’t wait for the weather to cool down, a little too much in the sweltering NY heat. Oh gosh yes, Chypres are great in the cooler weather. I’m a big fan of The Afternoon of a Faun too!